Hundreds of people attended a wedding between a man who says he is 112 years old and his bride who is only 17. The BBC reported Thursday that Ahmed Muhamed Dore - who already has 13 children by five wives - would like to have more with his latest, Safia Abdulleh. "Today God helped me realise my dream," Dore was said, after the wedding in the region of Galguduud. 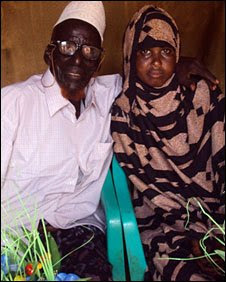 Dore said he and his bride - who is young enough to be his great-great-grand-daughter - were from the same village in Somalia and that he had waited for her to grow up to propose. "I didn't force her but used my experience to convince her of my love and then we agreed to marry," he said. The marriage, in the town of Guriceel, is being described by Somali historians as the first of its kind in the Horn of Africa nation for more than a century. The reaction to news of the marriage has been mixed. Some people said while it was allowed under Islamic law, they were concerned about the age gap, but others were happy that age was not a barrier to love. Dore told the BBC he was born in Dhusamareeb in central Somalia in 1897 - and has a traditional birth certificate, written on goat skin by his father. He joined the British colonial forces in 1941 and served as a soldier for 10 years. He later became a police officer after Somalia won independence in 1960. Dore has a total of 114 children and grandchildren. His oldest son is 80 years old and three of his wives have died. He hopes his new bride will give him more children. "It is a blessing to have someone you love to take care of you," he said.